The machine is a kind of modified Model WSD-600A Full-automatic High-speed Three-side sealing bag-making machine and suitable forproducing two-layer or multi-layer three-side sealing laminated film bags (bags for food,washing power and sweets,etc)which take BOPP, PET, CPP, PE, nylon, aluminum foil and paper as base material. With such characteristics as easy operation,smooth product,stiff and smooth and beautiful appearance,high-strength thermal edge sealing and high bag making speed,it is a kind of ideal equipment for packing and making bags. 1st, The whole machine adoprs industrial control level computer and auxiliary three-servo control. System. 2ed,All the parameters adopt CRT real time display.The bag-making speed, bag-making length, temperature, counting, punching and conveyor quantity of doubling finished product ,etc.can be preset. 3th,Releasing tension can be controlled by full-automatic adjustable magnetic powder constant tension control system. 4th,Automatic deviation-rectifying,double photo electric tracking. 5th,LPC automatic deviation-rectifying,double photoelectric tracking. 6th,New type pressure-lifting six time conveying function. 7th,Computer 16 group PID constant temperature control. 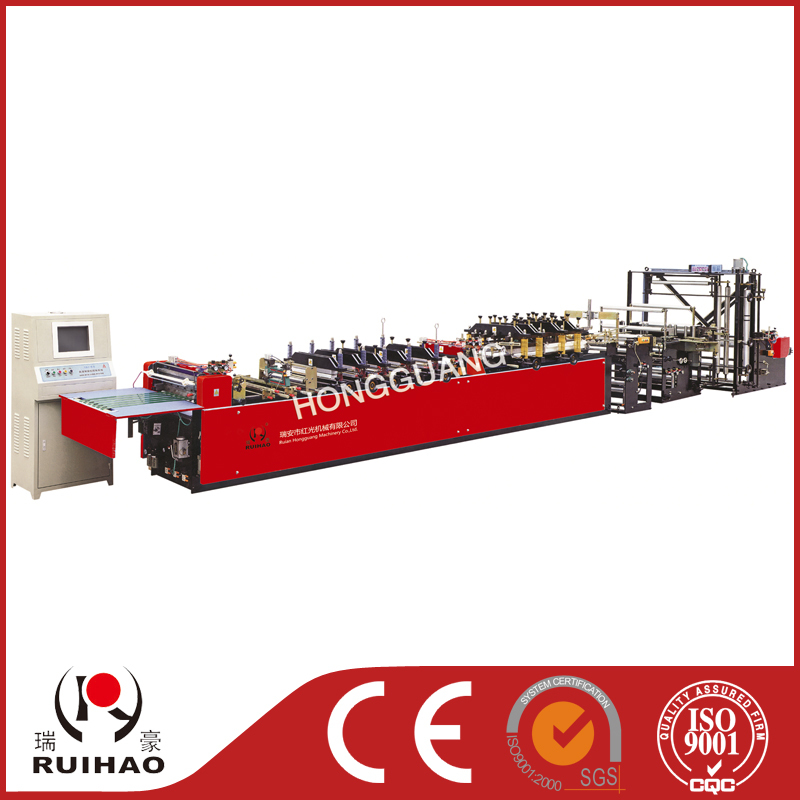 8th,Pneumatic multi-functional punching, automatic collecting of cut rim charge, electrostatic elimination. 9th, Technology of double self-standing bag,double concave-convex buckle device is in the lead at home,which can truly make bags by one machine with multiple functions.